“It is our goal to bring it all together concurrently,” Ryan told reporters after meeting with House Republicans behind closed doors. Ryan provided no details about what replacement elements would be included, calling it a “Senate question” about what Republicans can put in budget reconciliation. * Perhaps the most troubling (but honest) quote came from Rep. Brady. House Ways and Means Chairman Kevin Brady (R-TX) told TPM that some members in the GOP’s ranks had been surprised by the complications of repealing and replacing Obamacare. It was a central campaign promise and refrain, but in action, it is far more complicated to undo. * It’s not surprising that the demographic that elected Donald Trump is more pleased with what he’s doing/saying so far. But notice that he tops out at 46% with both men and white people. * Yes, Trump is still having trouble recruiting talent to perform at his inauguration. One person who has been approached tweeted her response. * In the current edition of the Washington Monthly, you will find an up-to-date list of Obama’s top 50 accomplishments. As a companion piece, take a look at the Obama Administration Scorecard from the National Urban League. 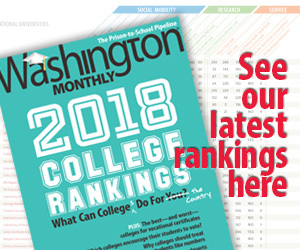 * Speaking of the list of Obama’s top 50 accomplishments, the Washington Monthly’s editor in chief Paul Glastris will be on Jim Bohannon’s radio show tonight to talk about it. We’d like to encourage our readers to call in to the show with your questions/comments. You can do so beginning at 10 pm Eastern time by calling 1-866-505-4626. For a listing of when/where the show will air in your area, check here. * Finally, tonight at 9 pm Eastern President Obama will give his farewell address (or what Edward-Isaac Dovere calls his “reunion-wake-celebration-pep rally-group therapy session”). In preparation, Key and Peele have released their final episode of “Obama’s Anger Translator.” It might not be a bad idea to watch this one first and get all your rage out of the way.